Sky Train Project | Hensel Phelps Construction Co.
More than 1,200 aircraft arrive and depart, over 600 tons of cargo is handled, and a $90 million economic impact is made on a daily basis at the Phoenix Sky Harbor International Airport. So how do you improve one of the 10 busiest airports in the nation? With a sky train, of course, to help facilitate the movement of the more than 100,000 passengers each day. Hensel Phelps recently commenced construction on Stage One of the Automated Train, or Sky Train, project, which features three stations, three miles of guideway and a 350-foot span over an active taxiway – the only guideway system in the nation to be installed over an active taxiway. “Stage One of the PHX Sky Train will transport Airport visitors and employees between METRO light rail, east economy parking and Terminal 4, which serves 80 percent of Sky Harbor’s passengers,” according to the airport’s website. Before the Sky Train, the airport relied heavily on buses for a mass transit system, causing traffic congestion around the airport. This new addition, however, is expected to result in over 20,000 fewer vehicles at the airport each day, which is a value close to 20 percent of a day’s traffic. The decrease in traffic will not only reduce curb side congestion around the airport, but it will also help the City of Phoenix reach future sustainability goals. And the project’s not just sustainable, environmentally speaking: Stage One of the Sky Train will create 6,000 jobs, according to skyharbor.com. Driverless cars will roll on rubber wheels, elevated in some areas and on ground level in others. 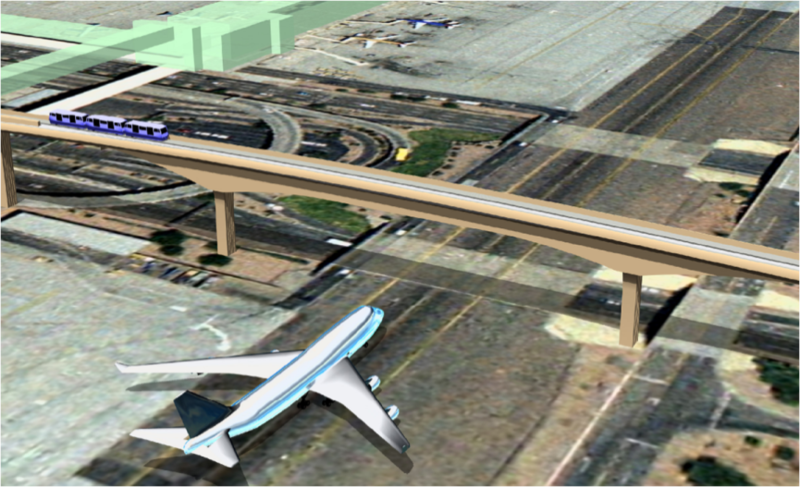 For more information on the project: skyharbor.com. Check out the construction photos in the below slideshow.